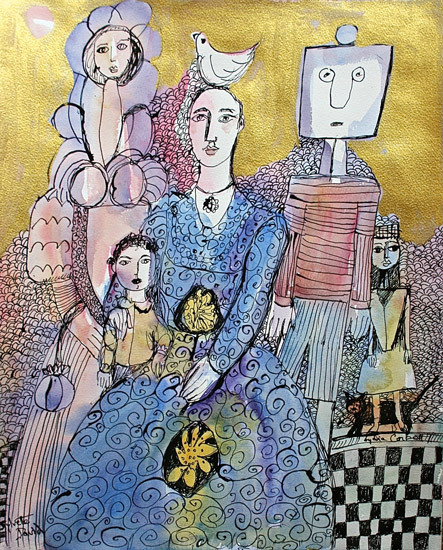 Private View at Fosse Gallery: Sunday 1st November 2015, 11am – 4pm. The Exhibition continues until Saturday 21st November 2015. There is a deep seriousness in the work of Lydia Corbett. It is engendered from the absolute sincerity that she brings to her art. This exhibition brings together watercolours and oils of the past thirty years. Whilst Corbett is a visionary painter, the starting point in Corbett’s work is often the attempt to find a still place from which to perceive the world. Her sense of place is balanced by mindfulness and resilience. Each time she returns there is an encounter with love or loss; or passion, for others – for beauty, for Picasso, or her love of painting itself. 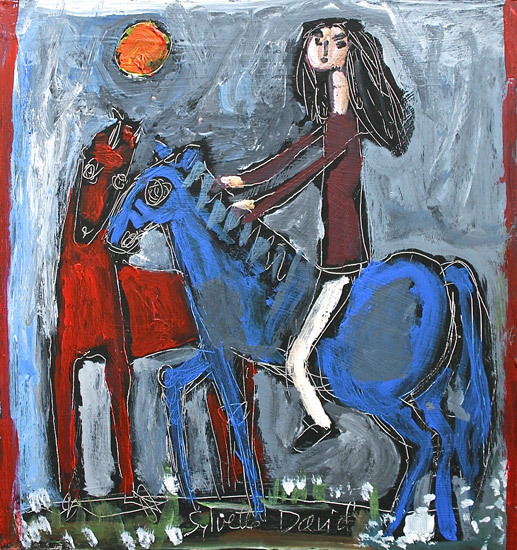 Her painting has become a timeless aspect of her life and this gives her work an enduring quality. We see this in the paintings ‘Patchwork Sylvette’, in ‘Columbines with Figures’, ‘The Magnolia Tree’ and in other paintings in the exhibition. Corbett’s watercolours with their embodiments of transparency, lend themselves to meditations on the here and now. In her opalescent palate, warm toned watercolours are suffused with an intense sensuality and some of them undergo osmosis rather than a transformation. As Kandinsky said: Colour is a power which directly influences the soul. The underlying concern of Corbett’s art is about transcendence and revelation from within. Her work is not governed by a metaphysical grand plan, however individual paintings do embody both moments of vision and offer a sense of permanence. Her works will us to an abiding stillness, they slow us down in our materialist world. They let us rediscover something elusive in ourselves, without a trace of insistence, an awareness which is otherwise lost. Her work possesses an aura. In her oil paintings, even work which appears at first glance to be of a reduced subject often has within it unexpected detail which expresses more. A dove for Corbett is all birds; a leaf is a whole forest, even when her works set out as abstractions; it is always in the direction of the world. The simplicity is not a poverty of spirit, it is about transformation. Her work is life-enriching, which is a major achievement. Corbett’s most recent painting have become more expressive, they have a new rawness. The secular touches the sacred in her work. The familiar becomes strange again; an ox eye daisy, or a grey angel or blue horses take on an otherworldly presence. This exhibition attests to the abiding questions about the nature and the process of painting, her preoccupations with the sensual side of life allows even the simplest of objects to become apprehended as art.